A star has landed in Penang, Malaysia. 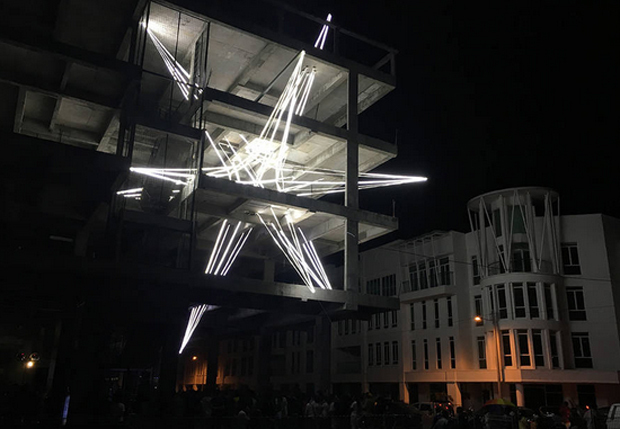 Built from steel cables and over 500 meters of LED light, artist Jun Hao Ong’s latest site-specific installation, The Star, traverses a four-story cement building to illuminate the 2015 Urban Xchange public art festival. 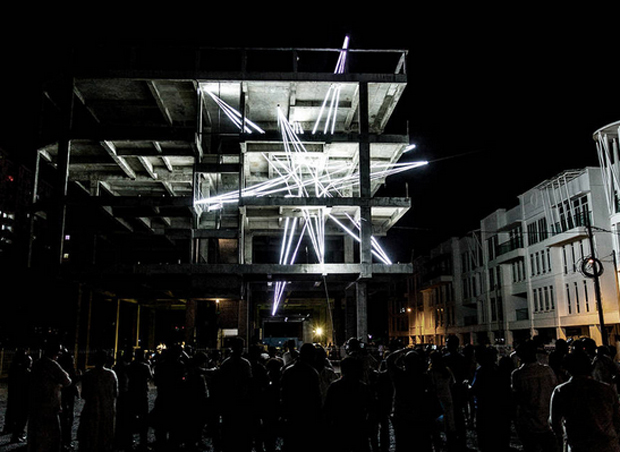 Steel rods fan out from the sculpture’s spherical center, piercing through the building’s foundation in an acute interconnected network of light. 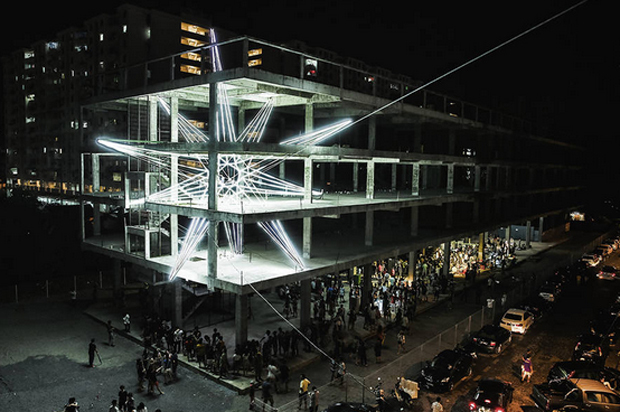 The sculpture looks like a colossal neon 3D spider web bursting from the third floor of a run-down building in the Raja Uda suburb of Butterworth, a city in mainland Penang. 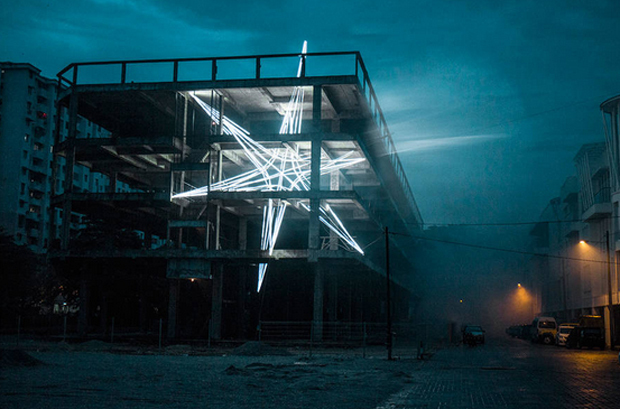 The Star is one of many light sculptures from Jun Hao Ong. 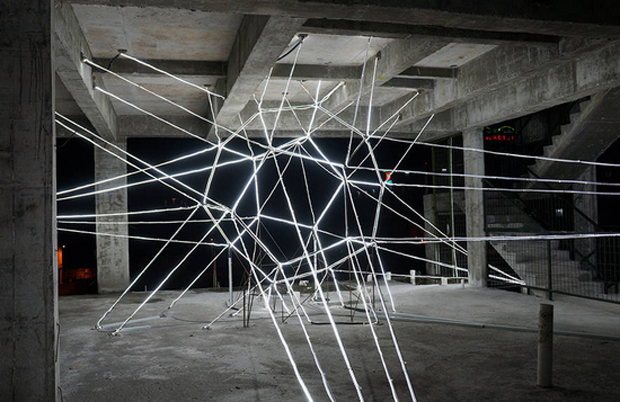 This piece is Ong’s submission to festival and exhibition held at the Hin Bus Depot, a contemporary art center determined on inspiring a new generation of contemporary Malaysian artist. The festival program brings together renowned international and local artists to encourage and challenge the artistic and creative potential of the city’s urban environment. Photos: Urban Xchange public Art Festival.